This supplement clocks in at 23 pages, 1 page front cover, 1.5 pages of SRD, leaving us with a solid 20.5 pages of content, so let’s take a look, shall we? So, a captivating introductory prose not only establishes the content herein, it also ties it together with the pantheon established for elemental lords in that respective file, though it does not require that pdf to fully enjoy – and after that, we are introduced to a big missing link in pathfinder lore. Let me elaborate: If you’ve come from a tradition of previous editions, your first impulse at seeing the chaotic neutral proteans would probably have been to bemoan the absence of slaadi due to closed content. Now, as it turns out, proteans actually are pretty much awesome and feel very distinct from their predecessors -however, unlike e.g. archdevils or demon lords, they had not really been touched upon. In fact, apart from AAW Games’ “Serpents of Fickle Fortune“, I couldn’t name a module focused on them or devoted supplement to extend the lore of their lords. 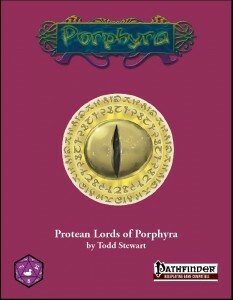 This pdf changes just that by none other than Todd Stewart delivering a whole pantheon of protean lords, the slithering symphony. The lords/ladies of the slithering symphony ultimately are, of course, chaotic neutral, but the array of diverse concepts and dualities within the respective proteans ranging from those devoted to rebirth and fertility to lords of entropy – and anything in between. The respective entries not only provide an internal consistence that makes the protean lords believable in their chaotic nature, they also sport an intriguing array of religion-traits, two per lord/lady and information on the respective spell preparation rituals can also be found. With a diverse array of favored weapons and creatures and unique symbols for the respective deities, this section, at least for me, left nothing to be desired – this pantheon is absolutely awesome – each of the different entries depicts an often intriguing aspect of certain aspects worthy of divine association – what about a protean whose moniker is literally the “Ghost in the Machine,” representing, among other things, the chaotic undercurrents in even the lawful disciplines – sudden inspirations, weird effects…this should be seen as an example: What these lords/ladies essentially accomplish is to somewhat dilute the tired and bland good/evil-dichotomy, enriching concepts usually tied to certain deities with a subversive angle – awesome. The pdf also sports 3 new subdomains, the most interesting of which allows you to execute wild surges, which hearken back to the hazarders and chaos mages of previous editions, allowing for the gambling with spell levels -temporary increases and decreases at the roll of the dice make this ability a sufficiently chaotic and nice domain ability. So far, this pdf’s core provides a glorious array of concepts I very much consider worthwhile – alas, this pretty much ends with the magic items presented within these pages. While I very much enjoy the concepts, their pricing and powers are off in various ways – flat-out +5 bonuses to ALL Charisma-based checks (remember, this includes feinting and demoralize and stacks due to a lack of bonus types) feels nasty for 18 K – and I don’t get the lackluster addition of 1/day chaos hammer as an SP added to the item. While I have no issue with the concept behind being able to ignore SR, DR and energy resistance, I do think there ought to be some scaling instead here – especially since item-activation of a standard action and carrying over the benefits to the next round only needlessly complicates the functionality of this item. Cloaks of the Imentesh allow, beyond their benefits, the assumption of an imentesh form “upon the form of an imentesh protean for up to 13 minutes, gaining a 30 ft. fly speed (perfect), and an imentesh protean’s tail attack and constrict ability.” So, can the form be used in increments? Why does it deviate from the standard of how polymorph effects work? Now don’t get me wrong, this latter one is not one I object to on the basis of being OP, but rather one that imho could have solved its rules in a more concise manner – does one become large? Senses? Fast healing? Is the tail attack of the base creature used at that HD or at the unmodified one of the user? Primary or secondary? I assume the default for tail slaps, but I’m not sure. Now I’m not going to dissect every one of the magic items, mainly because I do not want you to get the wrong impression – we are essentially talking about the supplemental content here and the validity of the pantheon itself is not hampered by these glitches….and, honestly, some of the items are pretty cool from a narrative perspective – what about an extremely powerful mug that may see you barf gemstones? No, I did NOT make that one up. Creativity and the theme of chaos work pretty well in some of these items, whereas in others, well, they do so in a somewhat lessened manner. Over all, I’m not a big fan of these items and urge DMs to contemplate carefully their inclusion in a given campaign. As a nice note, the great Illuminatus class by PDG gets a well-deserved shout-out in the spell-section, which imho provides some interesting options – for example, what about a spell that adds a confusion effect to the next spell you cast? The concept is awesome, but much to my chagrin, it has no duration, allowing you to “hold the charge” infinitely until you cast your next spell. While this can be rectified rather easily, it feels somewhat contrary to the chaotic theme of the spell, allowing for easy storage of the charge. That also remains my main concern regarding the thematics of some of the spells here, though admittedly, conjuring voidworm swarms is damn cool – over all, I would have loved to see the notion of the chaotic be reflected more in the respective spells: What if e.g. holding the confusion-inducing befuddling infusion worked only for a random amount of rounds? That being said, i do very much enjoy the interaction with the warpwave-rules of the proteans. Editing and formatting are very good on a formal level, while on a rules-level, there are some minor issues here and there, though nothing grievous. Layout adheres to a printer-friendly 2-column standard and the pdf comes fully bookmarked for your convenience as well as with awesome full-color icons for the deities. Todd Stewart delivers an awesome and iconic pantheon I very much enjoyed, manages to add to the lore of these beings in an admirable manner – and one that we all benefit from. Unlike many publishers, Purple Duck Games rendered these guys open content, so yes, any publisher may properly utilize them in all their glory – a practice I feel I should have mentioned much earlier in my reviews. At the same time, I do consider some of the spells as falling short of their potential (which does not make them bad, mind you!) and the magic items, are pretty short of what I’d consider awesome or particularly imaginative – though, again, some inspired ideas are in here as well. In the end, my final verdict will clock in at 4 stars – I drew quite a bunch cool ideas from this pdf and while it’s not perfect, it’s definitely worth its fair asking price. You can get this nice supplement here on OBS and here on d20pfsrd.com’s shop!